Download this 7-Step Guide to help make evaluating and selecting your manufacturing ERP system a more organized and less stressful process. 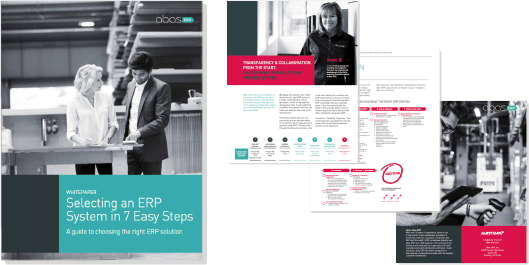 Managing the selection and implementation of a new manufacturing ERP system is a major undertaking for any small to mid-sized manufacturer or distributor, which is why abas ERP has developed a clear and thorough 7-Step Guide that simplifies the ERP selection process and helps you make an informed, confident decision. The process starts with an overview demo of the ERP system. Then we work through the discovery process, where we learn about your company and ERP requirements, and the workshop, where we give you a look at how ERP could help meet your business goals. If you like what you see, we provide you opportunities to interact with companies using abas ERP.